Set up the Square OAuth API to securely manage application permissions and access to other Square merchant accounts. To learn more about OAuth and how the Square OAuth API works, please see the Square OAuth API Overview. HTTPS is required for all Square API calls. HTTP is supported only for developing and testing on localhost. You have read the OAuth API Overview, which covers general functionality of the API. You are using the Square Connect PHP SDK. You are using PHP version 5.4. If your situation is different from the working example outlined here, you should still be able to follow along with the steps in this guide. When the user clicks Allow on the Square permission form, Square will send a response to the redirect URL configured for your application. You need to go into your Application Dashboard and set the redirect URL in the application control panel. Open your Application Dashboard. If you have multiple applications, click the one you want to work with. http://localhost:8000/request_token.php. In Step 3, we'll create the request_token.php file that this URL points to. Download the PHP configuration file template from GitHub and save it in your web root directory as sq_config.php. The Square OAuth API is not currently supported in sandbox so you cannot use a sandbox application ID with the example code in this guide. Create a new file and save it in your web root directory as get_permissions.php. This is the page that will start the OAuth flow. Add code to your new file to configure the permissions you want to request and use that information to serve an authorization link to your user. See the Oauth permissions guide for a full list of available permissions. For now, we will use basic read and write permissions for transaction processing (PAYMENTS_READ and PAYMENTS_WRITE). The permissions list must be URL encoded. For example, replacing spaces with %20. When users click the authorization it calls the Authorize endpoint and displays the Square OAuth permission form asking for the permissions in the list. The Square OAuth permission form returns an authorization code to the redirect URL you configured in Step 1. You must exchange the authorization code (a short-lived credential) for an OAuth access token (a long-lived authorization credential). OAuth access tokens enable your application take action on behalf of the associated Square account. 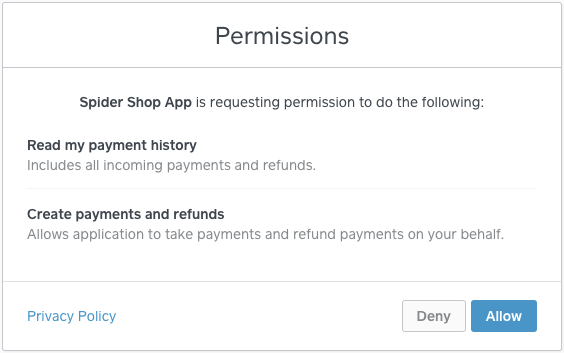 The Client Credentials flow is not supported by Square eCommerce APIs. Create a new file and save it as request_token.php to handle the credential exchange. The exchange code should live in password-protected area of your website, such as an admin panel. Add a function (getAuthzCode) to exchange the authorization code for an OAuth access token. If the API response is empty the function throws an exception. Read about fixing common errors for troubleshooting hints. Add another function (getOAuthToken) to exchange the authorization code for an OAuth access token. If the API response is empty, this function throws an exception. The client_secret must be supplied in the POST body of the OAuth API request. The optional redirect_uri parameter is ignored. The Application Dashboard OAuth settings page requires that you provide a Redirect URL. When the Redirect URL is provided in the registration, OAuth 2 specifies that it should be ignored in requests to Square API endpoints. Your application should store the access token securely. This example code prints the access code for testing. If you are not familiar with running a local web server, see Running local web servers for information about testing on your local environment before continuing. Open a browser and type in the URL for your new get_permissions.php file. For example: localhost/path/to/get_permissions.php. Click the authorization link on your webpage. It should redirect you to the Square permission form. OAuth allows HTTP calls from localhost for testing purposes. API calls from any other webserver must use HTTPS. See the HTTPS Overview to learn more about HTTPS and how to enable it on your website. The permission form only displays if you do not have a current access token. If you want to test your site repeatedly, follow the optional step for revoking tokens and be sure to revoke your token before testing again. Square OAuth access tokens expire after 30 days with an additional grace period of 15 days. After expiration, applications must generate a new access token using the refresh token received when the authorization was granted. For more information, see Renew OAuth Token. If an OAuth endpoint returns an error message instead of the values you expect, check here for the cause and most likely solution. Likely cause: An incorrect application secret was provided in a request to the ObtainToken endpoint. Make sure you have copied the entire application secret from the OAuth tab in the application control panel, and that the application ID and application secret you are using are from the same application. The authorization code in your Obtain Token request does not match the authorization code provided by the OAuth UI. The authorization code has expired because it was issued more than 5 minutes before calling Obtain Token.. Call the ObtainToken endpoint to generate a new authorization code and try again. Likely cause: The API request used an incorrect OAuth token. You are using a valid, unexpired OAuth token. Your OAuth token includes all the permissions required by the endpoint.